Storm Doris is wreaking havoc at UK airports with planes struggling to land amid gusts reaching up to 100mph (160kph) in some places. The fierce storm has claimed one life and is classed as a ’weather bomb’ by the UK Met Office. The gales have resulted in power cuts and widespread travel disruption and are moving eastwards across the UK. A woman from Wolverhampton died from serious head injuries she sustained when struck by falling debris. 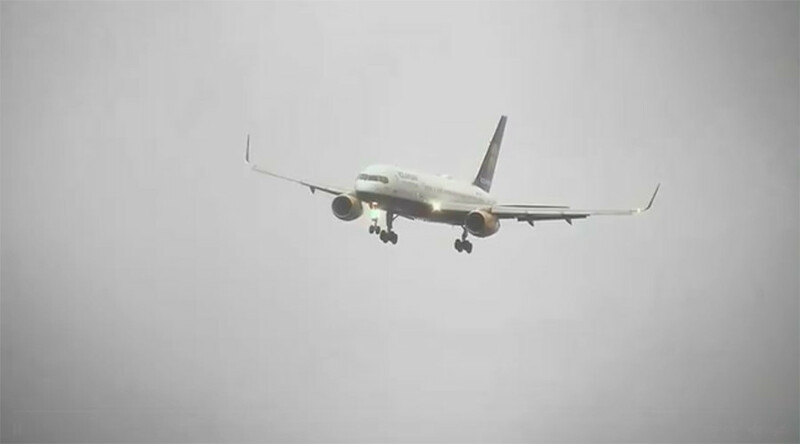 Many flights have been cancelled while other planes are battling the powerful winds in an effort to make a safe landing. Manchester Airport has suspended landings after a number of pilots struggled to land there on Thursday morning. Passengers on board an Icelandair flight experienced a bumpy ride as the plane descended at Manchester Airport. Nail-biting footage shows the plane swaying side to side before dramatically soaring into the air after the pilot decided not to land and declared an emergency. The flight managed to make a safe landing on its second attempt. Other planes made difficult landings while facing gusts of up to 50mph. An Emirates flight abandoned Manchester airport after a number of landing attempts and diverted to London.